AFP - Under the compulsory veil and despite hard times, Iranian women are unrestrained in showing off one feature on which they feel a need to spend money. Their faces. Man: "Where are you going that you are putting make-up for one hour?" Woman: "I plan to participate in handicraft exhibition!" Everyday wearing of makeup is probably more common in Iran, an Islamic republic, than in some liberal western countries. It is a rare opportunity to parade one's beauty without fear of official censure. With a female population of more than 38 million, Iran is the second-largest cosmetics market in the Middle East in terms of revenue, behind Saudi Arabia, and the world's seventh biggest. 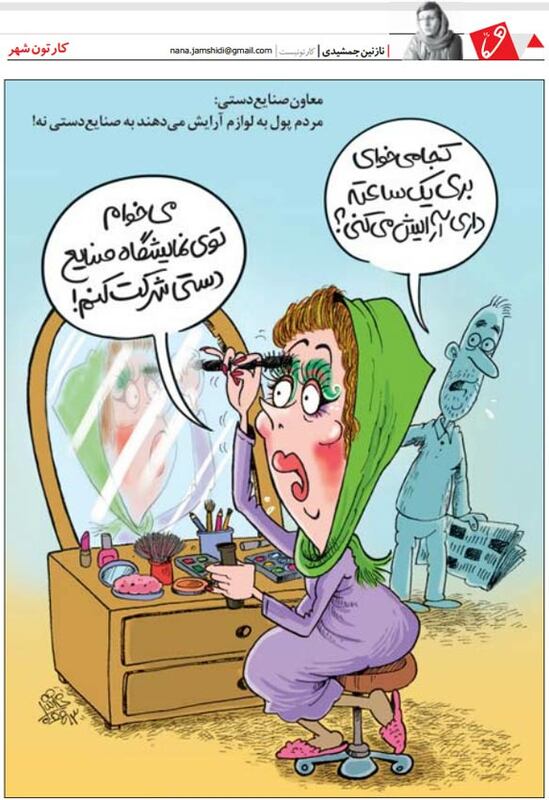 "Iranian women wear makeup as soon as they get up in the morning. Even if they feel ill, they know that they must look beautiful in the street," says Tina Zarinnam, 30, a fashion designer. (read full article by AFP).